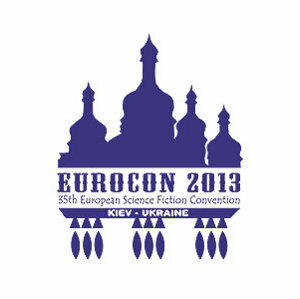 Because the Ukranian capital is where the 2013 European Science Fiction Convention is being held this year. Eurocons are the European equivalent to a Worldcon: an attempt to gather as many as possible European fans in one place. As Europe is divided into numerous states, some of which have more than one official language (that is not English! ), Eurocons tend to be significantly smaller than Worldcons. This is why someone sometime came up with the excellent idea of just sticking them onto an existing national conventions. It has become somewhat of a tradition and has had at least one funny little side effect: the date of the con can wander around the calendar year like a drunk. Admittedly, less so in recent years: Zagreb in April 2012, Stockholm in June 2011, Tricon in August 2010. Committees from different European countries bid for the privilege of organizing Eurocons two years in advance, the same as for a Worldcon. However, given that they are done by a totally different committee each year and often combined with an existing con gives them much more diversity. Every Eurocon, good, great or appalling, is unique. There are a few things that are always the same. The European Science Fiction Society has its annual business meeting at Eurocons. ESFS was founded in Trieste, in 1972, at the first Eurocon. The European SF Awards, which are administered by the ESFS, are awarded in a number of categories. This is where Sam Lundwall and Brian Aldiss got the European Grand Master award. Next year’s Eurocon is special because it is stand-alone. The Irish figured that there will be enough spill over from the London Worldcon in August 2014 to warrant that. And I, along with about 40 other Croatians who have already bought membership for Dublin in 2014, am in enthusiastic agreement with them. So if you are planning to go to Loncon 3, pop over to Shamrokon as well.